On Thursdays I post something from the archives. This is from June 2012. I’ve recently learned that it is now practice for bloggers to write a self-promoting press release when something bad happens . . . like this one. YOU GUYS. Something bad happened to me, too. 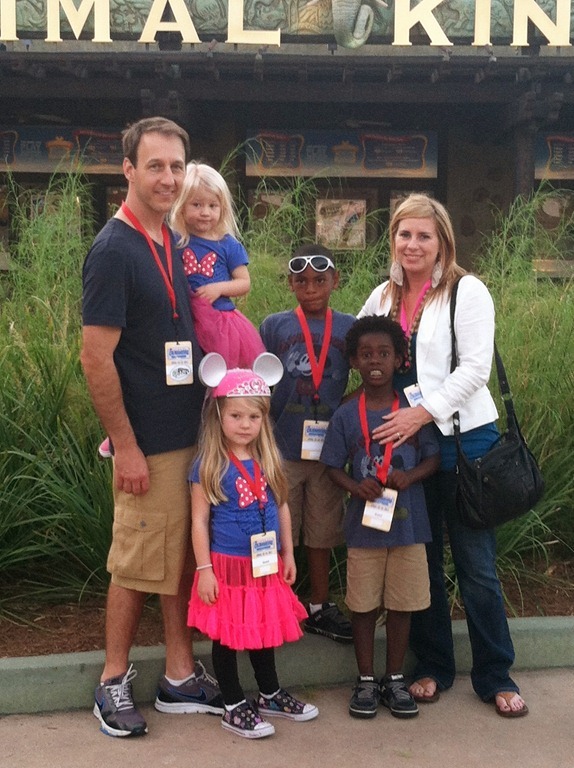 Kristen Howerton, famed blogger at Rage Against the Minivan, was spending the day at Disney’s Epcot theme park with her family, following the Disney Social Media Moms conference in Orlando, FL. Howerton, a wildly popular blogger named one of the top 100 in the “Funniest Adoption Bloggers of Orange County” by Circle of Moms, was enjoying the day with her husband and four small children when things went awry. Howerton and her family, before her ordeal. Kristen and her children entered the space simulator, after some negotiation about who would be the pilot and navigator, and who would take the less popular seat as engineer. Ultimately Kembe was relegated to this role, as his Alexa score was the lowest. What was supposed to be a fun family experience quickly turned sour, as the G forces knocked Howerton back into her seat. She immediately felt a familiar wave of nausea hit. As the ride progressed, her palms began to sweat and she felt clammy and light-headed. “I knew right away that I shouldn’t have ridden this ride,” says Howerton. “But I couldn’t get off because the doors were closed and the ride attendants were ignoring my knocking. It was 15 minutes of pure, nauseating torture.” Howerton endured the ride by attempting yoga breathing, and by requiring silence from her children and a passenger she didn’t know. Howerton found a spot to lie down near the gift shop at the ride’s exit. She slumped over in a toddler play area, where she scared several small children. After several minutes of not being able to move due to nausea and fear of vomiting, Howerton finally acknowledged that she was going to need help. “She was just laying there by the slide!” Kembe says. “She wasn’t moving, even though kids were playing all around her! It was funny.” Finally, a security guard approached Howerton, telling her that she was frightening other park guests and that she would have to move. Howerton explained her motion sickness to the security guard, who then called for a nurse from the park’s first aid clinic. Howerton disclosed that she did not believe she would be able to stand up without vomiting. A wheelchair was ordered. “I saw a princess,” said her daughter Karis. Howerton rested for approximately 15 minutes, and was given water and saltine crackers. Finally, she felt strong enough to rejoin her family. Despite the ordeal, Howerton is not shaken. “I can’t wait to get back there. I’m going to conquer that ride. I’m not going to let it conquer me,” she said. Howerton is a blogger, penning the widly popular Rage Against the Minivan, a blog with 525,600* daily pageviews. *numbers not verified, and suspiciously similar to a song from Rent.